'Quest' is a word that is bandied about a lot in discussions of Smile, Brian Wilson and Van Dyke Parks unfinished 'teenage symphony to God'. Musicians, music enthusiasts, cultural historians, pop culture 'train spotters' - an enduring parade of rookies and boffins - have been drawn to the myth and mercurial beauty of The Beach Boys' Smile music for almost four decades. In 1966 through '67, the anticipation and hype surrounding the album's release was fuelled by a public captivated by the creative zenith of a Hawthorne California wunderkind, a cluster of five golden-throated suburbanites, and the best session musicians and engineering talent in the industry. Add to that a prodigious 22 year-old wordsmith and a cluster of up-and-coming industry insiders and artists, and it's easy to see why Smile has taken on a life and legend of its own. Available sessions and songs from the Smile-era are chimeras of spectacular musical power and lyrical innovation: even in their fragmentary state, they provide an able testament to the scope of Wilson and Parks' ambition. Yet this masterpiece-in-waiting, perhaps overburdened with its fusion of classically-influenced avant-pop music and American history, slipped into oblivion amid a maelstrom of personal strife, misunderstanding, and acrimony. Well, not entirely - Smile never really disappeared off the map. 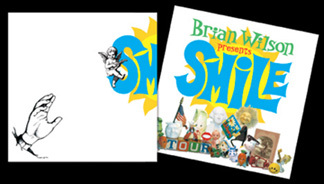 Parts of the mooted project evolved into the quirkily gorgeous, understated psychedelia of Smiley Smile; on this record, Brian changed his musical direction to reflect the simplicity and humour that he displayed on Party! (the highly successful 'unplugged' predecessor of Pet Sounds). However, generations of pundits have agreed with Carl Wilson's famous assessment that Smiley was 'a bunt instead of a grand slam'. Since then, Smile has experienced something of a left-field afterlife: songs that were destined for that album have emerged in various incarnations over the years (and, of course, sessions, fragments, and original mixes have been circulating on the collector's circuit for years); but the album - the whole - the unifying principle behind the shimmering collection of fragments and songs. That remained elusive. Still, a collection of music, a lost moment in time called Smile, evolved through the decades. Rather than curse its incompletion, fans have been captivated by it, and the search to understand the puzzle (rather than 'solve' it) keeps us hunting the archives, our eyes and ears glued to back-alley musical channels, scanning for ever more minute pieces that would help us better appreciate Wilson and Parks’ collaborative genius. 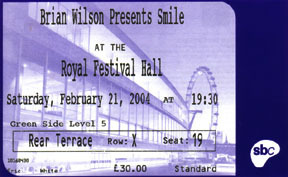 On 22 May 2003, one brief announcement changed all of the rules: Brian Wilson would be performing Smile live at Royal Festival Hall in London. Now, live performance and studio albums are two very different animals, so there was a lot at stake in the philosophical approach to this undertaking. Refreshingly, Wilson's musical director, Darian Sahanaja, approached the project in exactly that light. 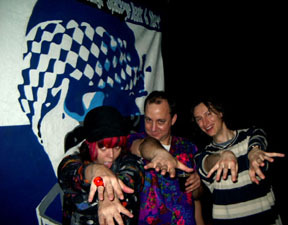 The 'musical think-tank' comprising Wilson, Parks, and Sahanaja did not, as was made clear in the event's programme, attempt to finish Smile. Rather, they sought 'to present this music to an audience with some sort of flow, some sort of cohesion' (Darian Sahanaja interviewed by David Leaf, 'The Myth and the Reality', Smile Programme: 10-14, p. 11). I had the privilege of attending the Saturday 21 February performance, and, like everyone there, was transfixed by the creative power and articulate, emotionally charged prowess efflorescent on stage that night. Objectivity tends to go out the window when an event of this magnitude and daring takes place - especially given the incredible risk taken by Wilson and Parks, and indeed, all the performers, a risk which the audience felt palpably involved with. It could at so many points have gone south. But it didn't. It came off - spectacularly! The show began with a Party!-style acoustic set, complete with cornball jokes and amiable banter. A band member threw out a reference to 'Dr. Love' to a slightly strained response, but the overall effect was to relax the crowd (and, presumably, the performers!) with an informal, inviting set. Moving swiftly on, Wilson provided a teaser of what was to come - an a capella rendition of the 'Heroes and Villains' b-side, 'You're Welcome'. This Smile out-take was followed by a series of Beach Boys classics, including the sterling 'God Only Knows' and 'Sloop John B'. The band were on fine vocal form by this point, and Wilson also debuted a few tracks from his new album, including the doo-wop tinged 'Soul Searching', to good effect. But the crowd was here for Smile, and when Wilson walked on stage for second part of the evening, the anticipation was electric and the applause deafening. By most accounts a more polished performance than the previous night, the Saturday 21 February Smile show lost none of initial impact. This was an auspicious debut that even a year ago seemed the stuff of fantasy. Fans from all over the world converged for this moment, putting faces to the lines of text with whom they've endlessly debated the finer points of an album that never was. Celebs and musos rubbed elbow with City professionals and students – in the end, we were all music fans witnessing the impossible, and to heighten the sense of shared purpose, we were led by a genius in a few rounds of 'Row Your Boat'. The musings that follow are an attempt to chart a way through the revolutionary sequence of Smile showcased in the performance. I draw on several generations of Beach Boys lore for context, and at the same time, try to get across the sense of innovation and activity that was all part of the experience. Enthusiasm has been the Smile-nerd's greatest cartographic tool - it has been the thing that has kept Smile alive through the decades - and this review makes no apologies for that; judging from the scrupulously researched restoration of the Smile live show, we can safely say that the geeks are all right! After a thunderous ovation, Wilson and his band breathed life into Smile with its opening benediction, the soaring Gregorian peals of 'Our Prayer'. Wilson intended Prayer to serve as 'a little, you know, intro to the album' when it was recorded on 4 October 1966. True to the original take, the piercing castrato added in the 1968 overdubbing was absent in the penultimate strain. This stunning rendition left the audience mesmerised and breathless with anticipation as the band delivered the incantation with note-perfect ease. Excited, broad grins and misty eyes darted across the rows, the crowds silently acknowledging what the reports of the previous nights had confirmed: this set was going to be, as they say in these parts, the business. Then, with a pause lasting barely a heartbeat, the band launched into another a cappella piece. With a nod to the relentless, effortless counterpointing typical of Wilson's Smile mixes, the exuberant a cappella interpretation of 'Gee' (by fifties do-wop group The Crows) propelled the set into 'Heroes and Villains'. A vintage major-key version of the chorus accompanied by tack piano set up the horn section's mellow, flutter-tongued introduction, which heightened the storming entrance of Wilson's full ensemble. The main body of 'Heroes and Villains' owed a lot to the punchy, raucous live versions performed by The Beach Boys in the early 1970s. Animated and deft, Wilson was on good rock’n’roll vocal form for this number, and the band stormed through the song with energetic conviction. Wilson's matured voice added a new poignancy to the lines 'I've been in this town so long that back in the city/ I've been taken for a lost and gone'; although he did use all of the lyrics, it was clear that he 'still had the jive' to not only 'survive' this Old West blitzkrieg, but to breathe new life into it! The live version combined existing mixes, and restored the 'Cantina' section featured in Wilson's 10 February 1967 'Heroes and Villains' mix (a safety copy of which debuted on the 1990 2-fer reissue of Smiley Smile/Wild Honey). Wilson expertly veered out of that ¾ time middle eight back into the single version released on Smiley Smile, a cappella interludes and complex tempo changes all intact. As per previous live outings, the band followed the final chorus with the ascending vocal part known as ‘Bridge to Indians’; a new addition was to conclude the song with the windswept 'Country and Western theme'. When this passage closed, the 'trackspotting' alarm bells began to chime as a brief new segue featuring a woodwind lead (which seemed to foreshadow the 'canvass the town and brush the backdrop' verse melody of 'Surf's Up') gave way to the pounding, rollicking 'Do You Like Worms'. Now this was a treat, possibly the crowning highlight in a night jam-packed with the critters. Smile illustrator Frank Holmes had previously confirmed that additional lyrics existed in a recent interview with the Endless Summer Quarterly: 'Once upon the sandwhich isles, the social structure steamed upon Hawaii', and 'Having returned to the West or East Indies - we always got them confused'. The first of these lines made its debut in the second verse, but the second remains in the vaults. There were additional lyrics in the first verse, beginning 'waving from an ocean liner'. Alas, my notes trail off into an illegible scrawl after that point, but on the net, fans have discerned something like 'leaving chained Indians behind her' as the other half of the couplet. Of all the new lyrics and melodies showcased that evening, these were the most exciting. Wilson sang a syncopated luau air, laid-back but muscular, that would not have sounded out of place on Smiley Smile. The original chorus line, 'Ribbon of concrete, see what you've done done,' was restored alongside Parks' reworked 'bicycle rider' lyric, which Wilson pinched (and then rewrote) in 1967 for the then-chorusless 'Heroes and Villians'. The familiar 'rock rock rock, Plymouth Rock roll over' vocal section was expertly rendered, brilliantly complementing the track's exquisite musical terrain. By combining scrupulous archival research with a creative process that was equal parts restoration and innovation, the task of re-animating Smile for live performance took shape. In a conversation with Sahanaja that I had after the show, he confirmed that working on 'Do You Like Worms' was one of the highlights of the whole experience. Watching and listening to the rebirth of the long lost lead line of 'Worms' has been the fantasy of many long-term Smile fans. Sahanaja knows this quest, and its multitude of quizzical minutiae, better than most: in the 1980s, he was involved in The Dumb Angel Gazette, a Smile fanzine that evolved into Domenic Priore's seminal book, Look! Listen! Vibrate! Smile! And to speak with him, one gets the sense that he still can't believe this is all happening, even after the thunderous applause that greeted every single pause in the performance. He enthused, 'never in my wildest dreams did I - we - expect this kind of response . . . it's quite staggering really'. He has been keeping the search alive for so long, that to finally get a sense of completion (without completing it per se) seemed almost unbelievable. So, 'Do You Like Worms' - finished? Well, apart from an absent middle eight, which appeared in Mark Linnet's 1992 Good Vibrations: Thirty Years of the Beach Boys boxed set mix, it sure sounded like it! The live version exhibited Wilson and Parks' interest in fusing exotica with American history, and the additions expertly filled in the blanks on the track that they mapped out back between 18 October 1966 and 5 January 1967. Evocative topology indeed: here…there be monsters! Tipping the hat to its cross-pollinated heritage, the crumbling harpsichord refrain at the close of 'Do You Like Worms' was greeted with another 'Heroes and Villains' fragment. The siren-like a cappella segue (as leaked on the Heroes and Villains Sessions I & II boot) woo-woo-wooed us into another elusive Heroes-related classic known as 'Barnyard'. Wilson glided effortlessly into the impressionistic farmscape hitherto only heard on bootlegs. The band's recreation of its inhabitants (including an especially impassioned bleating sheep) was guilelessly avant-garde and they carried off the onomatopoeic interjections with joyful professionalism. Their delivery made this left-field romp seem the most natural, logical piece of music in the world. This, they seemed to say, is what music has been missing out on in recent decades: unabashed, unironic sonic creationism that answers only to the mood established by the piece. Wilson also restored the song's lyrics. A version of these had materialized on the 'Heroes and Villains Demo' on the 1998 Endless Harmony Soundtrack (no mention, however, of 'Barnyard Billy', the character Brian refers to in the Don Was film I Just Wasn't Made for These Times). To hear them finally married with the instrumental track and cyclical backing vocals - the former recorded on 20 October 1966, and the latter, as Smile scholars Lou Shenk and Cam Mott have speculated, likely tracked on either 20 October or 13 December 1966 - completed a colourful jigsaw vignette from Smile-ville. And still the segments of the sonic caterpillar marched forward! 'Barnyard' instantly launched into a forceful instrumental version of the pop standard 'The Old Master Painter', which Wilson twinned with 'You Are My Sunshine' on 14 November 1966; originally labelled 'My Only Sunshine', Dennis Wilson gave a deliciously languid performance of the lead vocal a little over two weeks later. This vocal mix only survives as a poor-quality bootleg. Brian's vocal on Saturday was a moving tribute his bother's performance, his latter-day gruffness evoking Dennis' grainy style whilst remaining uniquely suited to the live arrangement. The cover-tune collage lacked the so-called 'Barnshine' tag (later known by fans as 'False Barnyard', a piece which Wilson pilfered for an outro to his 10 February 1967 'Heroes and Villains' mix), but that version only appeared on the rare Long Lost Surf Songs Vol. 2 bootleg and the exquisite (free!) cd-rom Project Smile, so not many fans would miss it. Besides, ‘Cabin Essence’ was up next. Andrew Doe has argued that this song, 'more than any other relic, hints at the lost majesty of Smile' (The Complete Guide to the Music of The Beach Boys, Omnibus Press, 1997, p. 58). ‘Cabin Essence’ is a long-standing favourite of mine, and live, it built the wistful 'You Are My Sunshine' into a locomotive 'American gothic trip' (as Parks describes the tune in theAn American Band film). Live, Wilson's lead on this track was poignant and rustic, and ably supported by the excellent 'doing-doing' backing vocals driven by guitarist Jeffery Foskett's soaring falsetto. The lead did not feature any lyrics other than those recorded by Carl Wilson in 1968. (Parks had penned some more back in the day, which read: 'Reconnected telephone direct dialling/ Different colour cords to your extension/ Don't forget to mention this is a recording/ Even though the echoes through my mind/ Have filtered through the pines/ I came and found my peace/ And this is not a recording/ Doobie doo Doobie doo or not doobie'). Wilson handled his brother Dennis' subcutaneous lead on the final chorus before an additional 'hey mister' prefaced the gloriously complex tag. The result was a dense, whirling vocal fog, and the band continued their admirable task of tossing off these intricate parts over equally demanding instrumental performances. 'Cabin Essence' concluded and was met with a well-earned standing ovation. Emerging out of the appreciative din were the delicate strains of 'Wonderful'. Wilson and Foskett's shared leads on this song and on others made for beautiful listening: the deeper, huskier voice of Wilson imprinted its inimitable DNA on the melody, while Foskett renovated the pure falsetto tones of original recorded versions (which were generally double-tracked). Wilson occasionally strained on the highs, but generally steered clear of any pitchy-ness, and the result actually added urgency and consequence to the delivery. On 'Wonderful, the lead melody weaved through the deceptively simple-sounding harpsichord-based instrumental, into which a few string pads had been added. 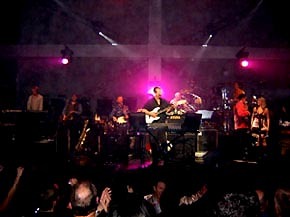 Fans will recall that the first Smile-era rendition of 'Wonderful' ends in a tantalising ascending bass line, which suggests that Wilson intended something to follow it. In the live performance of Smile, that bass part was absent; instead, a smooth key change on the harpsichord took us straight into an accelerated version of a tune originally labelled 'Untitled Song #1', later re-titled 'I Ran'. Better known to fans as 'Look' (the name later written on the song's tape box), the tune was tracked on 12 August 1966. This is an early Smile-era track that hinted at the light-hearted direction Wilson's original Dumb Angel might have taken. According to AFM contracts, vocals were recorded for this song on 13 October, but frustratingly, have never been located. Well, we have some now! The debuted live vocal parts fused themes from 'Wonderful' and 'Child is Father of the Man'. This union was a conceptual stroke of brilliance, which also happened to make for a very good pop song. As far as we know, 'Look' (or a version thereof) was not intended for the Smile release planned for early 1967; there was certainly no mention of it on the 466,000 copies of the album cover, nor in the 419,000 Smilebooklets printed in early January 1967. And yet, as far as Smile songs go, Wilson's edits indicate that 'Look' was a fully realised tune; one, appropriately enough, which had already indulged in a bit of musical quotation: certain sections bear a strong resemblance to passages of 'Good Vibrations'. 'Song for Children' (which, as Peter Reum has confirmed with the band, the song has become known as in set list), served as a crossroads for several Smile tracks. It carried over the introspection of 'Wonderful' in the verses whilst anticipating the haunting 'Child is Father of the Man' with an almost verbatim rendition of that upcoming track in the chorus. The genius of the live performance is that it compounded Wilson's praxis of self-quotation in Smile, and transformed what had hitherto been an out-take oddity into a potent, cross-referential hydra. The verse melody of 'Song for Children' roughly traced the woodwind leads extant on 'Look', clustering triplet rhythms in the lyric, 'Maybe not one/ Maybe you too/ Wondering / Wondering who/ Wonderful you/ Wondering'. The chorus vocal melody duplicated 'Child is Father of the Man' over the chorus of 'Look', but replaced 'man' with 'son' (or 'sun') in the first round. The jaunty bridge set up the second verse, which united the 'Wonderful' and 'Child' themes. A gorgeous, ascending 'Wonderful you' harmony took us out of the reworked second chorus into the bridge. Interestingly, a familiar ragtime riff in 'Look' was omitted from this rendition; interesting, because at this point in the set the arrangement concentrated on accentuating the gravitas of Smile over its exuberance (the latter of which would take hold in the final movement). Again, the dictates of the live arrangement worked extremely well with the track's status: 'Look' has always been marginal, a footnote in Smile lore. This, its former standing, eventually served as a boon for the live performance, because it may have allowed the song to become a vehicle for wayward bits without bearing the burden of historicist expectation. Not only that, it served as another opportunity to showcase the staggering modularity of Smile. The sessions, songs, and sketches of Smile thrive on self-quotation, both in their contemporaneous form and in their extended afterlife. If presented in toto, in some version corresponding to the track list on the original album cover, the possibilities for pop music would have been immense. My mate Chris, a Cambridge musicologist, composer, and pianist, noted that Wilson's constant reworkings of musical ideas approached the condition of Wagner's use of leitmotif and motives of reminiscence - the composers' strategies suggest associations, commenting on ideas past and on those to come. Their schemes challenge the representation of time and memory in musical expression. Which got me to thinking: part of Wilson's genius in Smile was to question the short-term memory of the pop song, which, in 1966-67, was a post-modern prescience bordering on the clairvoyant. The live performance continually forced the audience to refer back to remembered passages and anticipate forthcoming ones; it did not patronise the nigh-encyclopaedic knowledge that many of its fans have of the oeuvre, but exploited and celebrated it. The tracks on the outskirts of Smile's original track list - those outlandish creatures sketched into the white areas of the map - take every advantage of their liminal status to parade not only the diversity, but the surprising unity, of Wilson and Parks' vision. So we segue into another enduring Smile mystery: was there a lead line and additional overdubs planned for 'Child is Father of the Man'? And how would the song take shape? This particular track cemented Sahanaja's achievement as an inspired researcher for the live performance of Smile. In conversation with him after the show, Sahanaja explained to me how he examined Carl Wilson's vocal on a multi-track of 'Child is Father of the Man' culled from the archives. He further isolated the headphone bleed from this track and was able to discern unheard backing tracks and vocal parts! This sleuthing influenced the direction this song was to take - audio detective work par excellence! Wilson's musical director also relied on a recently discovered Wilson mix dating from 12 October 1966, which lived on an 18 December 1966 compilation reel and clocked in at just over three minutes. This version had rescued the song from its previous existence as an incomplete collection of rough-sounding oddities, and minimalist re-visitations of spring 1967. Parks had lately confirmed that verse lyrics were written for the song, so there was some idea of how 'Child' might have functioned as an honest-to-gosh pop song before its live debut. For the show, new lead lines and melodies complimented the jaunty-yet-mournful quality of the song. The result was pure Pet Sounds. Wilson's arrangement interpolated his original mix: the final chorus of 'Song For Children' contained the 'Child' chorus, and although a bridge from 'Look' intervened before the lyricless first verse, the structure of 'Child is Father of the Man' remained consistent with the earliest mix thereafter (although, strictly speaking, we had to wait until the spellbinding tag of 'Surf's Up' to hear the final chorus). And, as hoped, we did get lyrics in the second verse, which sounded something like, 'My Child, years just enough to be me/ I believe/ Out of the wild, into my youth can conceive/ You'll achieve'. Another chorus of 'Child is Father of the Man' set up the well-known threnodic bridge, which began Mark Linett's 1988 mix for a then-mooted Smile collection. This arrangement introduced a novel, blues-influenced string arrangement that sounded - well, not necessarily of Smile vintage - but none the less effective for it. The transition had clarity and swaggering power, and created a potent transition into the emotional nexus of Smile, the sublime opus 'Surf's Up'. Wilson has performed this difficult track before, and this was his best performance of the song to date. His voice added a sagely and reflective quality to the track, which, in its heyday, sounded the very soul of yearning aspiration. Memory and current performance intertwined to devastating effect. He did not seem as rushed when interpreting parks' elliptical lyrics as he did in previous outings, and he pushed his voice further up the register than he has done in a long while (although, per standard, Foskett handled the highest parts, seamlessly blending into Wilson's lead). Parks' lyric on 'Surf's Up' has never been surpassed: chock-a-block with puns and incessant word-yoking on a par with Hart Crane's best, this truly is a jewel of pop-modernism. The second movement featured a new string arrangement, which lead to speculation that it might originate from the lost 'Surf's Up' sessions of 21 and 23 January 1967. The string parts cushioned the sparse arrangement on the 1971 Surf's Up version, which recycled Wilson's December 1966 piano-only rendition for CBS TV, and provided another dimension to the concluding section. As the closing strains of the 'Child is Father of the Man' tag rang out, the crowd rose to their feet, erupting in applause. Counterpointing his faithful rendition of 'I Wanna Be Around', Wilson then proceeded to 'Friday Night', the musique concrete workout that featured the band recreating a carpentry shop out of thin air. He turned in an inspired performance on the power drill, drawing appreciative cheers from the audience, before launching into the crowd-pleasing 'Vega-tables'. The song proceeded as per Linnet's mix on the Good Vibrations boxed set, but after the second verse and 'bop bop' bridge, ended the song with the surprisingly angelic a capella tag heard on the Smiley Smile version. The set felt like it was accelerating at this point, and increasingly, Wilson looked to Smiley Smile to flesh out the remaining tracks. For instance, the next track, a vocal version of the familiar bootleg-only instrumental 'Holidays', concluded with the 'whispering winds' tag from the Smiley Smile version of 'Wind Chimes'. That vocal tag was based on the coda of 'Holidays', and was almost inaudible on Smiley Smile, as though it were a deliberate echo of Smile's delicate grandeur. Restored to its full arrangement, it was breathtaking, and another example of how the comic and the sublime co-existed in Smile. Wilson's sang his lead to the woodwind melody of the original track, but a surprising twist came in chorus: the chorus of 'Do You Like Worms' surfaced amongst the slide whistles and clanking marimbas! Again, the ambiguous status of 'Holidays' in the mooted '67 release seems to have freed it up for a live reworking. Wilson and his band took some audacious risks with the live arrangement, and the resulting hybrid paid off in spades: the balance of innovation, restoration, and sheer surprise is the very ethos of Smile. 'Holidays' immediately crystallised into 'Wind Chimes' and again the audience was treated to another Wilson-Foskett shared lead. The higher notes challenged Wilson on this one, but it was a sweet, breezy rendition. The choruses were raw and raucous, and the horn section tore into them with relish. 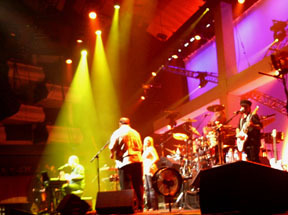 Wilson joined in on his Yamaha keyboard for the first bridge, and he restored to the song a bridge and chorus from a discarded extended instrumental. (Smile Shop guv Jon Hunt did an excellent fan mix of this tune a few years ago that foreshadowed this compelling arrangement). And out of the powerhouse final chorus of 'Wind Chimes', the tell-tale chromatic runs of 'Heroes and Villains Intro' built up the instrumental fury of 'The Elements Part 1: Fire' (also known as Mrs. O'Leary's Cow, the beast supposedly responsible for the great Chicago fire). 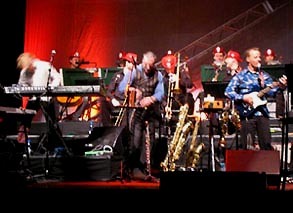 Bursts of applause crackled through the audience as the Stockholm Strings'N'Horns donned plastic fire helmets in tribute to the original smoke-filled sessions. 'Fire' sounded as avant-garde today as ever it did. The addition of Smiley Smile-era vocals was intriguing, and the chants of 'Fall Breaks and Back to Winter (Woody Woodpecker Symphony)' added an eerie glow to the inferno on stage. Crashing drums and timpani portomentos 'put out the fire' as the fuzz bass cooled to a legato tempo. Hot on the heels of the fire element was the so-called 'Water Chant', released as a middle-eight of 'Cool Cool Water' on the 1970 album Sunflower. Saturated in echo and reverb, this dreamy a cappella workout introduced a new lead vocal by Wilson: 'Is it hot as hell in here or is it me?/ It really is a mystery/ If I die before I wake I pray the Lord my soul to take my misery/ I could really use a drop to drink/ Somewhere in a placid pool and sink/ Feel like I was really in the pink'. Another clever lyrical dialogue (in the pink? blue Hawaii? Lovely!) and we were off to luau land. As Smile bootleggers have long predicted, Wilson launched straight into a fully developed rendition of the late-Smile classic 'I Love to Say Dada' after the freeform chanting. 'Dada's' connection to Smile has been questioned for quite some time. The song was recorded after the band's publicity agent Derek Taylor wrote in the 6 May 1967 Disc and Music Echo that 'every beautifully designed, finely wrought inspirationally-welded piece of music made these last months by Brian and his Beach Boy craftsmen has been SCRAPPED' (reprinted in Look! Listen! Vibrate! Smile! , 2nd Ed. p. 191). However, the tune was not recorded in Wilson's home studio, and recently, an early piano demo of the song called 'All Day' was discovered on a 3 January 1967 'Heroes and Villains' reel. That definitively places the tune within the Smile era. To complete 'Holidays' and 'I Love to Say Da Da', Wilson and Parks appear to have dipped into the Smiley Smile pool of tunes. The composers' affinity for the supremely laid-back numbers 'Little Pad' and 'Whistle-In' are evident in both lyrics and melodies. The result was something like a high-brow Jimmy Buffet ballad, coasting along palcid seas on helium-filled dinghies. 'I Love to Say Da Da' brought us full circle, back to Hawaii, the Sandwich Isles that Parks sketched out in 'Do You Like Worms'. A stunning vocal line, 'Hawaii way beyond the sea', was the standout moment in the chorus, and the verses sauntered along with buoyant good humour. The track closed with another hybridised segue that sounded close to portions of 'Surf's Up'. So was this line-up the elusive Smile track 'The Elements'? Well, Fire was definitely 'Part 1: Fire'. As for the rest, there were, as we have seen, so many intersecting themes in Smile that they are very difficult to isolate into a definitive taxonomy. I think the best way of looking at is to consider that we had a number of songs with heritage that can be traced to Wilson's 'elemental' pursuits: chanting, instrumental experimentation, musique concrete, bold effects-use, and visionary pictorial passages are all represented in the preceding songs in various measures. Elements…of 'The Elements'?…is I think as good as we're going to get on this mystery. Then a treat for my friend Anthony - a new Smile fan smitten by 'Prayer' and captivated by the project's pan-historical preoccupations - came in the form of another brief pass at a section of the 20/20 jewel before the inevitable closer, 'Good Vibrations'. Except it was not 'Good Vibrations' as we know it! Wilson restored portions of Tony Asher's original lyric, and resurrected certain sections from the 'Good Vibrations' sessions, including the stellar 'hum-be-dum' vocal part in the extended bridge. This seemed to be a statement: nothing from the Smile-era was beyond renovation; any track, no matter how 'finished' or 'unfinished', could be remade to celebrate the staggering variety of musical ideas set down during this period of Protean creativity. One of the most perfect singles ever recorded, 'Good Vibrations' was infused with a new, almost liturgical energy in this performance. The reception nearly brought the roof down, applause rising through the ceiling into the crystal-clear night air over Royal Festival Hall that evening. Soul Music. The audience remained on their feet until the end of the show as Wilson bookended the performance with a set of Beach Boys and solo favourites - a great way to cut loose after such an emotionally absorbing performance. 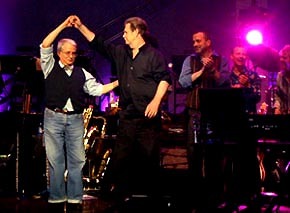 Parks received a rapturous welcome as he joined the band to play the shaker on 'Do It Again', and he put in a brief appearance at the after-party. The energy level at that gathering was high. Wilson's biographer David Leaf busied himself in capturing reactions to the show on film. Band members, Smileaficionados, musicians, and event folk swarmed about, trying to keep track of their reactions to new pieces, but lost in enthusiasm. As Smile buff Peter Beyer put it: 'I don't know, if Smile had been released in '67, that it would be as good as this!' To agree with that or not is almost irrelevant - it was that kind of night…! Peter, Dan Lega and I legged it to catch the last train to Tottenham Court Road for an after-after party with Domenic Priore. The Metro Club was having a Blow Up night, which seemed the perfect environment to catch up with the pater familias of Smile scribes and author of Look! Listen! Vibrate! Smile! (Last Gasp of San Francisco, 1989, 2nd ed. 1997). Gogo'ing the night away in a loud Hawaiian shirt, Priore greeted us with a hearty handshake in the packed club. When we were finally installed at his table (amid beer showers and frenetic shimmying), I was given a sweeping overview of Smile's position in the history of Los Angeles and pop music fuelled by his excitement about the show. Priore has always emphasised the cultural context of Smile, and his latest book, Riot on Sunset Strip: Rock 'n' Roll's Last Stand in Hollywood, 1965-1966 (forthcoming, from Chronicle Books), promises to establish him as a chronicler of L.A. Music history. Yet in the wee hours of Sunday morning, the debates around Smile minutiae seemed the farthest thing from our minds: what was important were the seas of people around us, shaking their collective thangs to an aggregate of '60s pop and current rawk. 'There's new music happening', Domenic shouted through the din: 'the White Stripes, Outkast'; fresh music that fights back against the decline of independent bands' and labels' autonomy in the music industry, which he had traced assiduously throughout the night. We agreed that the current level of interest in Smile marks a new epoch: people are looking, people are listeningwith renewed vigour for expressions that, to coin an old Modernist edict, 'make it new'. That old Marshall McLuhan chestnut 'looking forward through the rearview mirror' seems to be the order of the day as Brian Wilson, Van Dyke Parks, Darian Sahanaja, arranger Paul Mertens, and the rest of Wilson's touring ensemble restore an avant-garde masterpiece to its rightful place in pop history. Perhaps we're just about ready! 1. The following Beach Boys releases (cd, unless otherwise noted): Good Vibrations: Thirty Years of the Beach Boys boxed set; Smiley Smile/Wild Honey 2-fer; Friends/20/20 2fer; Sunflower/Surf's Up 2fer; Endless Harmony Soundtrack; Hawthorne, California; An American Band (full version DVD); Endless Harmony dvd. 2. Project Smile cd-rom; available free from various lovely folk online, this is a collection of almost every available Smile track and fragment. It includes a playlist-based interface that allows the user to create his or her own mix of Smile! It also includes video, a timeline, and other multimedia goodies. Required reference. 3. This list of bootlegs neither condones nor condemns, simply lists for reference: Vigotone 2 CD Smile set; Heroes and Villains Sessions Parts 1 and 2; Vigotone Heroes and Vibrations; Long Lost Surf Songs, Volume 2; Dave Prokopy's Smile Tape Set; Sea of Tunes Unsurpassed Masters Volume 16: Good Vibrations Sessions; Sea of Tunes Unsurpassed Masters Volume 16: Smile; Sea of Tunes Unsurpassed Masters Volume 17: Smile Sessions; Sea of Tunes Unsurpassed Masters Volume 18: The Alternate Smiley Smile; Picaresque 5-disc Archaeology. The Smile Shop is the best Smile resource on the web, and their message board is an excellent place to glean knowledge from all manner of wisdom-heads. Excellent articles, interviews, and sessionographies by Cam Mott, Jon Hunt, John Lane, Lou Shenk, David Prokopy, Brad Eliot, Bill Tobleman, Tobias Bernsand, and many others. Get thee hence! Domenic Priore & Brian Chidester's newly invigorated Dumb Angel Site! Special thanks to: Darian Sahanaja, Jason Pierce, Domenic Priore, Becky Ebenkamp, Peter Beyer, Jonathan Litchfield, Dan Lega, Anthony Miller, Chris Weston, Ray Newman, Ronnie Dannelley, Richard Powell, and Bob Hanes. For enthusing: Jon Hunt, John Lane, Cam Mott, Lou Shenk, Kenny McMillan, Tobias Bernsand, Micha, John Gwatney, Matt Bell, and Jason & Louise.